A month ago we released a report on public trust and confidence in charities which showed a significant fall in trust. Since then we have convened a meeting of senior leaders in charities to talk about joint work in the sector and spoken with a number of other charities about how to address this very serious issue. What’s encouraging is that most charities we talk to take this issue seriously. They realise that this is a decline that needs to be reversed and, ultimately, may have a serious impact on giving and volunteering levels. The research highlighted a number of issues as to why trust has declined. However it also told us what gives people trust. One key aspect raised in this respect was management, or governance, in charities. What’s the problem with charity management? We know from our case reports and statutory inquiries that there are certain things we see time and time again, - from trustees not knowing their duties, to not challenging dominant individuals, to not understanding conflicts of interest, to poor decision making. Even more simply, some do not even realise there’s a duty to file an annual report and accounts each year. A lot of the time we see basic mistakes. And these dent people’s confidence. So what can we do to improve management and governance in charities? We have been working to revise our guidance and make it easier for everyone to read and access, from The Essential Trustee last year to key pieces of guidance this year on fundraising and financial resilience. We have been writing in a simpler, more direct style to try to make it easier to understand. And we are keen to make sure that we are in direct contact with trustees, so that trustees get our updated guidance as it comes out. While we continue to offer speakers and training wherever possible, we will be looking into video over the next year to get a better reach for our guidance. We are improving our induction materials. And we want to use Trustees’ Week in November to promote effective recruitment of new trustees, raising standards by bringing in people with new or different skills rather than recruiting among your own network of contacts, and who can be brave and challenging. While we work on this, we are also supporting other initiatives in the sector. For example, there is a major piece of research looking to baseline what trustees know and what skills they have, by Cass Business School Centre for Charity Effectiveness and Cranfield Trust, which we are involved in. The sector is working to review the Governance Code for the Voluntary and Community Sector. And the House of Lords is looking at Sustaining the Charity Sector and the associated challenges of governance – and should report next year. 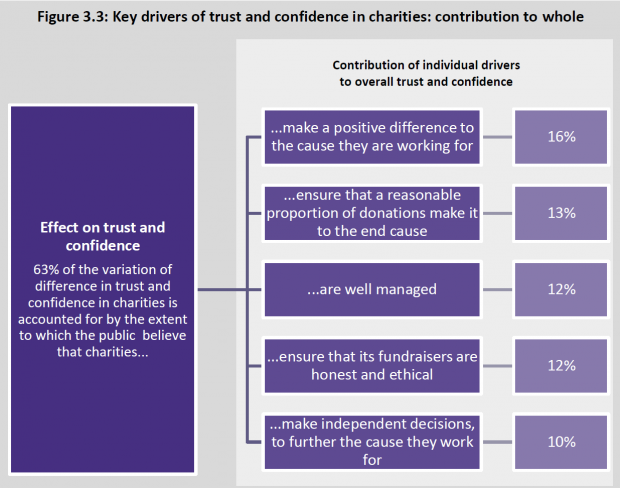 What can charities and trustees do? Charities and trustees may want to focus on training, and on raising standards. You could make a start with our guidance and checklists; and at Trustees’ week later this year, many sector bodies and organisations will be sharing their training with all trustees (7-13 Nov) to help boost understanding in the sector. You may also want to get involved in the conversations about governance in the Governance Code review, at the House of Lords, or with Cass Business School. Update your charity details here so we have all your Trustee email addresses. It may be your charity does all of this well already –and in that case why not share your knowledge with others? How did you do it well? What did you need to make your team work? Could some of your trustees work with other charities, applying peer-to-peer learning? The point is that the sector is affected by individual charities failing to come up to the standards the public – and the regulator - expects. We need your creative input on how to get best practice applied across the sector. What’s absolutely certain is that this is not something that a single organisation or individual can do alone. We need to work on this together. Good to see the various actions being worked on pulled together into an action plan. Unfortunately another area where the Charity Commission is working closely with the sector got omitted. This is a group looking at quality and improvement in the sector that's focusing on quality standards. They are a great tool to bring structure to the review and improvement process, and the achievement of a quality mark demonstrates that as an organisation you have reached an agreed level of policies, systems and practice. Our PQASSO bulletin out today highlighted how using PQASSO can really help with addressing the issue of public mistrust. The PQASSO standards promote good practice in all aspects of good governance and good management. I am very grateful that the Charity Commission are making guidance much stronger particularly on commercial ventures and accumulating losses, and being transparent on relationships. between voters and Cabinet for the betterment of both. Keeping track of an Executive and monitoring the claimed outputs I think is probably beyond the reach of an average good Trustee Board. And of course does provide a pool of intelligent people who can become Trustees. Why have the commission not mentioned the role that they directly have in public trust? The idea that an industry is effectively policed and managed by a trusted and proactive public body has not been mentioned. At each stage the Commission have stated it is down to trustees however they've not made any effort to create any sort of training route (although the essential trustee is a good guide, new and inexperienced trustees, if not enveloped into an experienced board, will not be trained properly - this is a major risk in smaller charities and if they go on to be 'experienced' trustees of larger organisations then the risk is extended without mitigation) there are no accreditations I know which can prove a trustee is competent in their skills or knowledge of charity law (beyond obvious legal degrees etc). They're doing this for free, and most do a great job, however the commission should make it very simple for new trustees to obtain the skills needed and refresh skills to match updated laws, as trustees taking on this work and liability is whats keeping the commission going. The Commission states "there are certain things we see time and time again, - from trustees not knowing their duties, to not challenging dominant individuals, to not understanding conflicts of interest, to poor decision making" - this is worrying as every person involved in charities I've spoken to have not had a good word to say about the commission, even MPs in my local area have referred to them as a 'chocolate fireguard', I agree with them from personal experience. The charity commission needs to find methods of either making it much easier for a board to get around these stated frequent issues via Training, forced requirements in constitutions [i.e max terms, changes after a charity makes a certain amount or has existed for a certain period of time to reduce founders syndrome], making conflicts clearer, setting more limits, to proper policing of issues or working closer with local CVCs to make them the first port of call and the CVC then escalate any needed matters to the commission. If these are frequent challenges faced by the commission and the only thing they have been able to say is 'its down to the trustees' I don't find this an acceptable use of public funds, to allow these issues to continue to occur without changing process or policy to remove this redundant workload. By not amending their plans and policy to support Trustees and to properly protect charities and not support those in wrong doing and leave investigations and criticisms to untrained trustees then they can expect nothing more than a reduction in public trust. It sounds as though the commission is without resources by their own doing, which is then having a negative knock on effect to the industry as a whole, showing up major cases like Kids Company, which the commission should have stepped in sooner and investigated as soon as allegations had been made. What's the easiest and/or best way to provide feedback on the good bits / issues I've seen as a board member of a number of charities? On the blog - or if you feel it's too much for the blog I'm sending you an email address! to whom can I talk about concerns I have about a registered charity, their real purpose being different from that advertised & their methods in getting (sometimes large) sums of money from vulnerable people? It is a complex matter ad I cannot fit it into any of your convenient boxes!